Who likes Chinese takeout? I DO!!! 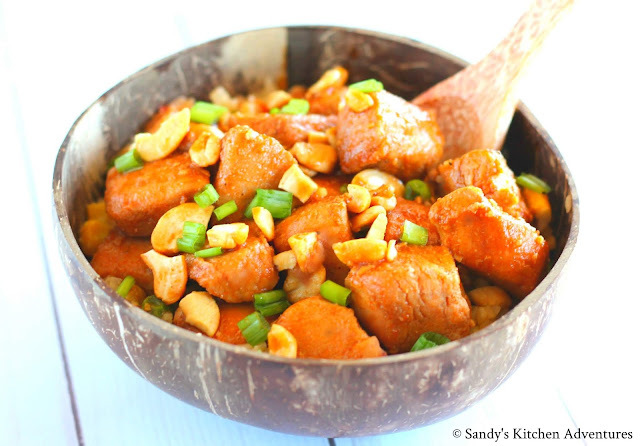 Here is a healthier and tastier version of Cashew Chicken that comes straight from the slow cooker! Start off by cutting the chicken breasts into 1 inch pieces and then browning the chicken in a large skillet sprayed with cooking spray for about 3 to 4 min. Then add the chicken to a slow cooker along with the sauce. Cook on LOW for only 2 1/2 to 3 hours. This allows the chicken to marinate and absorb the yummy sauce while cooking. You could always place whole chicken breasts in the slow cooker (skipping the browning step) with the sauce and cook for a longer amount of time, but this results in shredded chicken. Shredded chicken would be delicious on salads or lettuce wraps! 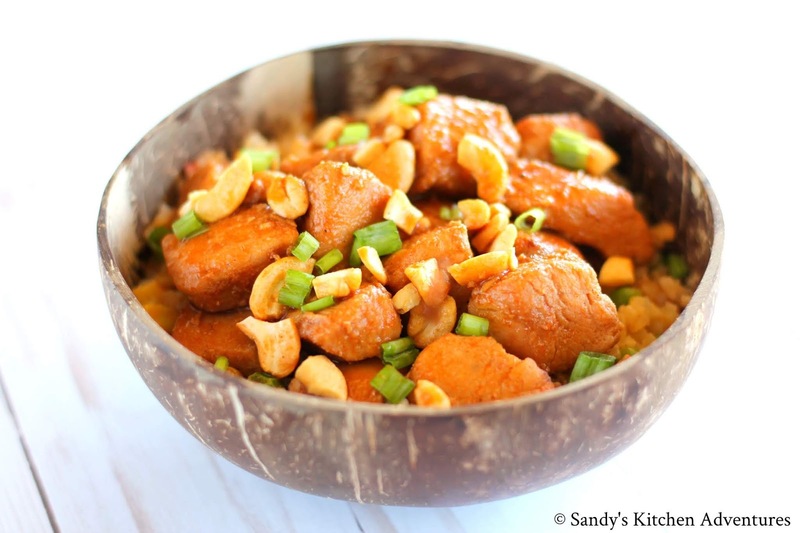 When the chicken is done cooking, divide into 3 portions with the sauce and garnish with cashews and thinly sliced green onions. There won't be a lot of sauce, but it makes yummy marinated chicken! Just make sure you do not overcook the chicken to prevent dryness. I chose to add the cashews at the end to individual portions for two reasons. I prefer the cashews to be crunchier when adding it as a garnish. Plus, it is easier to keep count of the correct portion size (1/3 ounce is 1 Healthy Fat) of the cashews when their not already mixed into the dish. I served this dish with 1 1/2 cups of Trader Joe's fried cauliflower rice (3 Greens) and it was a delicious combination! Enjoy! Spray a non-stick skillet with cooking spray and season chicken with salt and pepper, if desired. Brown chicken in skillet, stirring occasionally for about 3 to 4 min. It will continue to cook in the slow cooker. Add chicken to the slow cooker. Make the sauce. Combine soy sauce, ketchup, vinegar, sweetener of choice, garlic and ginger in a small bowl. Pour the sauce over chicken. Gently toss chicken with sauce to coat. Cook on LOW for 2 1/2 to 3 hours. Since the chicken is browned in the skillet first, it doesn't need a lot of time in the slow cooker. This method results in moist cubed chunks of chicken. If you want the chicken to be shredded in texture, you can use whole raw chicken breasts and cook on HIGH for 4 hours or LOW for 8 hours. Then shred the chicken with a fork after cooking. 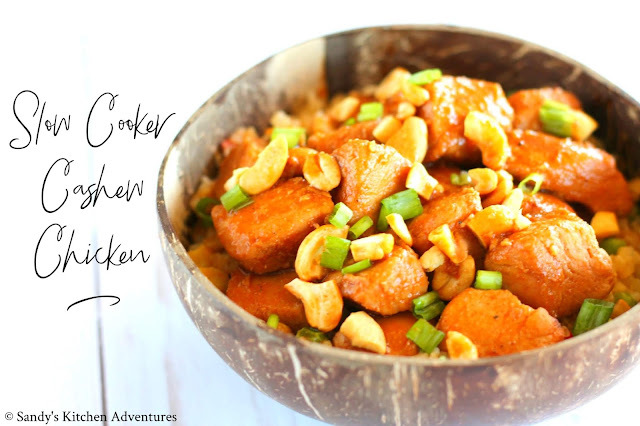 Garnish with 1/3 ounce of chopped cashews and sliced green onions per serving. Serve immediately. Enjoy! *Add 3 Greens to complete your Lean and Green meal. 1 1/2 cups of grated cauliflower or 1 1/2 cups of steamed tri -color cabbage are great options!